Something interesting has been happening in the Midwest this week, and depending on which newspaper you pick up with your morning coffee you might think it involves beleaguered law enforcement heroically facing aimlessly angry mobs intent on destroying everything in their path, or you might think a town with a population majority of racial minorities has been besieged by overzealous Call of Duty wannabes who enjoy flouting the 1st Amendment. Of course, I'm referring to events that have been unfolding in Ferguson, Missouri since Saturday after Mike Brown, an unarmed teenager, was shot dead by an as-yet unnamed Ferguson police officer. His death, and the unanswered questions surrounding it, led to the small community coming together to hold a vigil Sunday in hopes for answers, and in support of Brown's family. However, racial tensions have simmered in Ferguson for years. The town of 21,100 is two thirds Black, and a third white, yet its police force only employs 3 Black officers. The department has also been subject to investigations involving racial profiling, including an investigation by the Missouri attorney general's office which concluded Ferguson police officers were twice as likely to arrest a Black person during a traffic stop than a white person. All that tension came to a head when law enforcement arrived at Sunday's vigil armed with big guns and bigger militarized vehicles. Violence broke out, a convenience store was damaged, looting took place, and tempers on both sides flared. Then Monday happened. Again, the crowds gathered. Again, law enforcement met them. This time, with a bigger force. Over 300 officers from over 30 agencies were on scene. Tuesday: same story. Wednesday: again. The crowds of protesters were allowed to assemble in town during daylight hours, but each night, police tried to forcefully remove them and any media present. They used tear gas, rubber bullets, and noisemakers to disperse residents and journalists alike. Wednesday, two journalists, and a town alderman were arrested. Another media outlet was targeted with tear gas and then their camera equipment was disassembled by armed officers wearing gas masks after the reporters had fled the noxious smoke. It should be noted that aside from the looting Sunday night, looting hasn't happened since. And the crowds assembled on the streets have mostly been peaceful. Angry, yes, but mostly peaceful.So now we come to your morning paper. Now we've arrived at that bit of newsprint with its vague smell of oil-based inks mingling in with the brew dripping from your Keurig machine. First of all, your local newspaper may not even have a story about Ferguson on its front page. Image sourced from Time reporter Andrew Katz's twitter, @katz. Apparently, 4 days of protesting, law enforcement illegally denying people the right to assemble, also illegally prohibiting the media from reporting, as well as arresting journalists, doesn't seem to warrant coverage. Hmm, go figure. But, if you are lucky enough to see a headline in your paper, take a closer look at that giant, sans serif header. And take a closer look at the blocks of text underneath. If you do, you'll notice an interesting thing about the language used to describe the events in Ferguson. Let's take a look at the local daily, the St. Louis Post-Dispatch. Their Director of Photography, Lynden Steele, tweeted out a screen grab of their front page just after midnight. It was later retweeted and praised by others. The paper's official twitter retweeted those tweets. Looking "above the fold" you'll first notice the sub-header calls the events of the night "stand offs." Seems innocuous enough, doesn't it? That's what happened. There were Ferguson residents on one side, and armed and armored law enforcement officers on another, awkwardly facing each other across the street like a bunch of tweens at their first boy-girl school dance. Except that phrase, "stand offs" is pretty loaded. It implies violence. It implies tension. So what, you ask? Things were violent and tense, you say. But take that phrase and combine it with the remaining variables above the fold. There is the passive phrase "tear gas used to break up protesters." The tear gas canisters just fired themselves out onto the crowd, did they? Then there's the centerpiece variable itself: the photo. A lone person cowering in the middle of giant plumes of tear gas. How do all these variables combine, and what does that amalgamation mean for how you, the reader, interprets the events in Ferguson? They combine to paint an incredibly skewed picture. The residents of Ferguson are violent. Their protests aren't demonstrations against racial inequality in their town, they are acts of aggression. The law enforcement presence is minimized. The cops were there doing a job, but you aren't shown how or how many were there. The lone protester is in a sea of smoke from an anonymous source. And that source is purposely anonymized with that sub-header where the 'tear gas [was] used." And there's more. The accusatory tone continues in the secondary stories teased below the fold. The people of Ferguson are further vilified with words like "rancor" used to describe the atmosphere. The sub-head there demonizes them in comparison to law enforcement, describing them as "defiant before police." The accompanying photo shows a Black man who is being restrained by another man, appearing as if he is charging at the photographer, or someone near the photographer. It is an angry photo matched by an angry headline. It is an angry black man, the greatest thing in America to be feared, and stopped. Next to this is the tease for the law enforcement side of the story. The language here is telling, too. The police are made to appear almost hapless.They are made to appear polite. They are making a "plea" for patience. They are asking nicely. Pretty please, with a cherry on top, won't you please be patient, Ferguson? The accompanying photo here shows Ferguson Police Chief Thomas Jackson, a white man, surrounded by media, hands raised as if in supplication. It's rich, really. Now hang on, before you start huffing and puffing to tell me I'm making much ado about nothing, consider that different language most definitely could have been used. Tone matters. And in a newspaper, when you have to condense a main headline down to three words or less, and subheads to less than 10, generally, every word is important. Every word is scrutinized and given careful consideration. Sometimes one person comes up with those headlines. But sometimes, especially for the "big" stories, ones that warrant multiple articles with multiple by lines, those headlines are decided upon by committee. It's pretty safe to assume with the amount of resources and staff the St. Louis Post-Dispatch dedicated to covering the protests in Ferguson, and the number of inches those events take up on today's front page, those headlines were thought up, talked about, debated, talked about some more, and finally blocked out on a virtual page. As were the photos. The photographers would have sat at their desks, with their picks carefully selected and edited, awaiting final selection and approval from a photo editor or other supervisor. The photos would have been printed out and passed around, looked at, and mulled over. They would have been pared down to just a few, and then debated over again, before each lead photo was finally selected. So many other words could have been used in those headlines that weren't. The gathering of people to demonstrate against the police could have been called "protests" rather than "stand offs." The crowd wasn't acted upon by invisible bogeymen, and that, too, could have been made more clear. "Police used tear gas against protesters" rather than a discombobulated "tear gas used" and the implied blame of "to break up protesters." The blame that continues to be levied against Ferguson residents by saying "Protesters remain defiant before police" could not have been levied at all, and the headline could have just as easily been shifted to read "Protesters continue to demonstrate undeterred by police." Are you starting to see how the tone can be changed? How the tone affects your perceptions? Are you starting to see how words have power, and in the confined space of a headline, that power is always wielded carefully, and purposefully? Again, things are anonymized, and issues are minimized in the headline. "Anonymity in police shooting" is a bit ambiguous. Who was anonymous? "...fuels frustrations." Who was frustrated? Where is the mention of race? Where is the mention of police-initiated violence? Where is the mention of media suppression? Where is the mention of suppression of the right to assembly? Sure, that's what the story itself is for. But any number of those things could be alluded to in the headline. And in the photo that originally accompanied the story online we are again faced with a single person facing off against police. At least in this photo we actually get to see the police. So I can still hear you, talking to your computer screen, telling me I'm full of it. I can hear you coming up with all sorts of rationalizations for how and why the words and the images are what they are in these two publications (and in others like them). But let me ask you something: are you white? Because the majority of journalists in American newsrooms are. Less than 15% of newsroom employees are people of color (POC), and that's a problem. The stories of POC are overwhelmingly told by people who are not people of color. Our stories are told by people who don't know what our experiences are like. Our stories are told by people who are used to listening to and also perpetuating a narrative of us that puts us at a distinct disadvantage. The police shot tear gas, rubber bullets, and noise makers at unarmed citizens with arms raised. The police forcefully removed national media presences from Ferguson, and even went as far as arresting two journalists. The police arrested an elected official for simply showing up for his constituency. The police have a history of disproportionately arresting more Blacks in Ferguson than whites. The police continue to refuse to answer questions about the death of Mike Brown. We still don't know for sure how many times he was shot, or whether the shots came from in front of or behind him. We still don't know who shot him. We still don't know why this happened. And yet, with all of this that has happened, the headlines still imply that the residents of Ferguson are doing something wrong. The headlines still imply that the police are reluctantly taking actions against the populace they are sworn to protect. The very media that was targeted by the police are still making them out to be the good guys, the guys that showed up at your elementary school on career day and told you all about how good it feels to help people. Why wasn't a photo like this on the front page of the St. Louis Post-Dispatch? And why does the staff of the Post-Dispatch feel like they can keep congratulating themselves on their coverage? 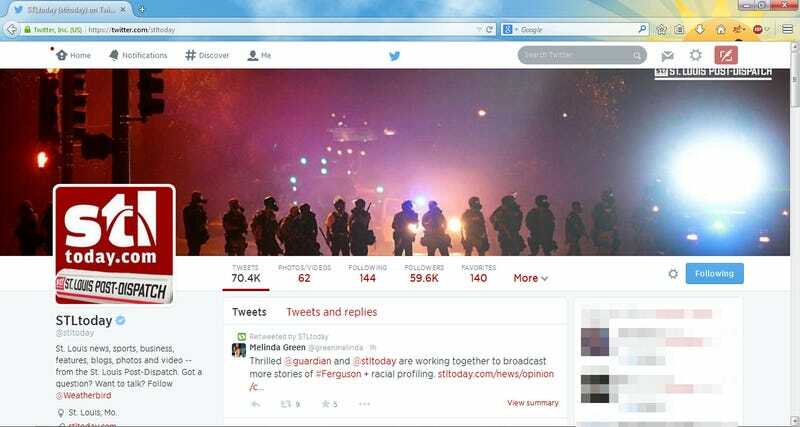 Top image: A screen shot of the St. Louis Post Dispatch's official Twitter page.